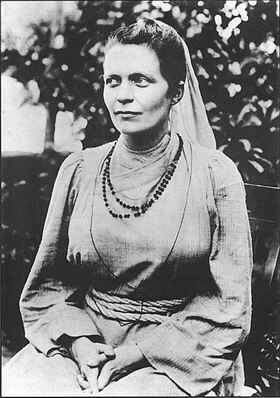 The great offering, giving her life for Mother India, was like a song of love, Love is blind for it sees no faults of the beloved, and Nivedita never found faults with India. Sister Niveditas childhood name was Margaret Elizabeth Noble. She was born in Ireland on October 20, 1867 to parents Mary Isabel and Samuel Richmond Noble Her father was a preacher to whom religion meant service to the poor. This had an imprint on Nivedita. She was very intelligent and hard worker, loved music, art, and the natural sciences. After her education, she spent ten years in teaching, from 1884 to 1894. She had a gift of being able to impart knowledge and inspire her students She was a proud, generous, impulsive and ardent woman. By the age eight~eil she came to understand that religion did not mean belief in the doctrines; it meant search of Divine Light and Eternal Truth. She began to doubt the truth of the Christian doctrines. She started reading about Buddhism but only with partial success. This was the time when she met a Hindu Monk, Swami Vivekanand, visiting England in 1895. She attended all the lectures. In question-answer sessions, she was an active and enthusiastic participan!. The Swamiji's words that selfishness, ignorance, and greed were the evils which brought suffering to the world, pierced through her mind and heart and her life changed for ever. Swami Vivekanand was very much impressed and urged her to help the women of I,?dia in his plans. In response to the call of Swaini Vivekananda, Nivedita left England and arrived in Calcutta on January 28, 1898. Swamiji could envision her future role in the service of Mother India. He initiated her to be his disciple on March 25, 1898 and gave her name 'Nivedita', meaning one who is dedicated to God. She started to study Gita and practice meditation. This helped her to cast off her pride in English culture and became humble. Salvation for one self and the welfare of the world were two of the ideas she pledged herself to follow, For this, she lived a simpler pure, and holy life to realize God and humbly work for the welfare of the people. She inspired the people in all walks of life through her lectures and writings She always believed that India could not be great and powerful unless there was unity. She emphasized this in every possible way and was never tired of speaking about it. Her hard work and lack of rest was having an adverse effect on her health She passed away on October 13, 1911.